If you want to house a Betta couple together the aquariums doesn’t have to be big and Bettas are know to successfully spawn in aquariums no larger than 5-10 gallons. The aquarium must contain a lot of good hiding spots because the female needs to hide from the male to relieve stress and avoid injury. Live plants will help you keep the water quality up, but artificial plants will be just a good as hiding spots. Chose a male and female fish of roughly the same size, but do not house them together yet. (They should be of roughly the same size to avoid one of them ending up badly injured.) The pair should be given a lot of nutritious food; you can for instance provide them with a combination of high-quality flake food and live brine shrimp. The water quality must also be kept up and the water chemistry should resemble that of their native environment. When both fishes are healthy and well-fed, it is time to introduce them to each other. Start by placing their aquariums close to each other and allow them to watch each other for a couple of days. Proceed by making it impossible for the male to see the female for a while, before moving him to the breeding aquarium. When the male has spent an hour or so getting used to his new home you can put the female in a hurricane globe and gently place it in the breeding aquarium. This will prevent the male from getting at her right away. Carefully monitor your fish and see if they show any interest in each other. Flaring is a good sign, and hopefully the male will soon start building a bubble nest. Do not release the female from the hurricane globe until the male has built a fairly big bubble nest and the female is showing vertical strips. She should also be assuming a head-standing position in the globe and ideal have a protruding breeding tube (look behind the pelvic fin). When you release the female, it is perfectly natural for the couple to engage in some nipping and chasing. Keep an eye on them and only intervene if one or both is getting badly injured. Really violent attacks means that they couple is not ready to breed, or simply incompatible. Place the female back inside the hurricane bowl and let her stay for a few days. Some couples need to be together for 4-5 days before they start to breed while others can start within an hour. Some females will even start releasing eggs while they are still inside the hurricane bowl. When the time is right, the male will try to attract the female to his nest and she will follow him. As they reach the nest, the male will embrace the female and she will release her eggs. The eggs will sink to the bottom of the aquarium and the male will swim down and pick them up. Directly after releasing her eggs, it is normal for the female to stay completely still and motionless for few seconds while the male swims down. When the spawning is finished, the female will leave the nest voluntarily or be chased away by the male. In most situations she will have plenty of time to swim away and hide while he is down at the bottom searching for eggs. The female should now be removed from the aquarium since she will either eat the eggs or be violently attacked by the male as she tries to eat the eggs. Both the male and the female will normally have acquired torn fins during the courting process and they are therefore quite susceptible to disease. Most breeders therefore safe-guard by treating the breeding aquarium with MarOxy or similar and placing the female in a separate recuperation aquarium instead of letting her join other fish in a community tank. Treating the recuperation aquarium is also a good idea. Approximately 36 hours after the spawning really tiny fry will start falling out of the bubble nest and landing on the bottom of the aquarium. At this stage, the fry will look more like a black dot with a tiny tail than a miniature fish. The male will swim down to the bottom, pick up the fry, and place them back inside the bubble nest. As you can see, it is very important to let the male stay with the fry. Do not remove him until the fry is free swimming. In some cases, the male will however start eating the fry that he retrieves from the bottom and if you notice this type of behavior the male should be removed from the aquarium. 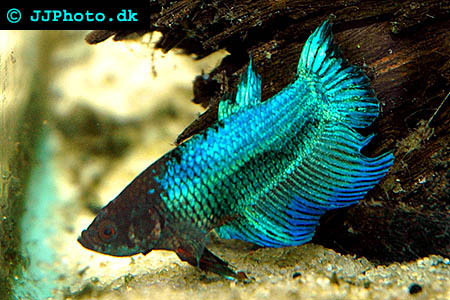 It is possible for Betta fry to develop even if they have fallen down to the bottom of the aquarium, as long as there are no other fish in the tank that can eat them. Newly hatched fry will feed off their yolk sac and should not be given any addition food. When the yolk sacs are gone, you can start giving them infusoria. After roughly two weeks the fry will be big enough to eat newly hatched brine shrimp and microworms. Feeding your fry a lot of small servings throughout the day is better than giving them a lot of food 2-3 times a day. It is very important to keep the water quality up in the breeding aquarium. The new water has to be of the same temperature as the water in the breeding aquarium, because Betta fry do not handle temperature changes well. It is hard to perform water changes without involuntarily sucking up the tiny Betta fry, but they will normally survive being siphoned out as long as they are returned to the aquarium immediately. Betta fry are extremely small when they hatch and even when kept on a nutritious diet they are remarkably slow growers. In most cases, you will not be able to notice any coloration until they are over 7 months old. The tiny fry will spend most of their time at the bottom of the aquarium and move only when you feed them. As the males mature, they will grow increasingly aggressive and should be moved to their own aquariums or jars. The females are more docile and can be kept together in the same aquarium until they are big enough to be sold or given away to other aquarists. If you have used a very small breeding aquarium you may have to provide them with bigger housing to keep them healthy and happy.